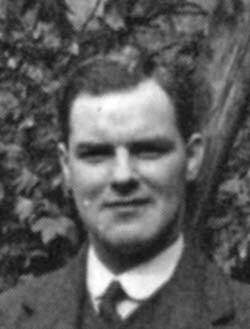 Bert Brocklesby wrote extensively about his varied experiences as a Conscientious Objector. A school teacher from Doncaster, he applied for exemption early in 1916 on religious grounds. Bert went before his local and appeal Tribunals in February and April 1916, and was given exemption from Combatant Service Only by both. To Bert, this was an unnaceptable decision - joining the Army, even in a Non-Combatant role meant going against his deeply held conscientious belief that war in all forms was a crime. He was arrested as an absentee after refusing to obey the order to report to his nearby barracks to be enlisted into the Non Combatant Corps. Bert refused to compromise his principles in any way, and did not even take the step of signing his Army papers - denying the military authorities even this rudimentary control over his life. For making this stand, and for disobeying other orders, Bert was Court Martialled and would soon become one of a group of COs sent to France from Richmond Castle, Yorkshire, as military prisoners. CO legend has it that Bert managed to drop a cleverly edited field service postcard out of the train while being transferred to France for further punishment. This postcard alerted CO sympathisers that men were being transferred to the combat zone, where, considered to be on active service, they could be sentenced to death for disobeying orders. Bert would find this out on arrival at Henriville Camp, Northern France. It is hard to imagine the kind of pressure Bert and his comades must have felt, but they managed to courageously resist, refusing to crumble under the face of this extraordinary threat. Bert’s letter had managed to reach the right people, and political pressure from CO supporters and sympathisers had forced the army to relent. Soon after, Bert would be sent back home to Britain to serve his term in prison in the hands of the civil authorities. By the end of 1916, Bert’s Conscientious beliefs on war had been tested by the Central Tribunal in Wormwood Scrubs and he had been judged a genuine CO - one allowed to work on the Home Office Scheme. Bert took up the offer and was sent to Dyce Camp to quarry stone with primitive tools in atrocious conditions. Soon afterwards the camp was closed after the systematic neglect of the COs working there had resulted in the death of one CO, Walter Roberts. Bert chose not to continue with the scheme, realising that it was both simply another form of punishment for men who believed war was wrong, and a way of using COs to carry out work that could help the war effort. In rejecting the HoS, Bert became an Absolutist CO who would spend much of the rest of the war in prison, finally being released in 1919. Despite the terrible experiences he had suffered throughout as a CO, Bert joined the Friends War Victims Relief service soon after his release, determined to not just protest against war, but provide aid and support to some of its neglected victims in Austria and Russia. Throghout his life he continued to work for peace.